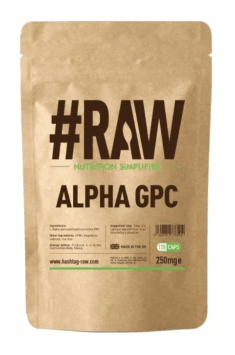 Raw Series Alpha GPC is a dietary supplement which contains only choline alfoscerate, known also as Alpha GPC. This form of choline ensures maximum bioavailability and easily crosses the blood-brain barrier. Because of that, it is extremely effective in improving the health and functioning of the central nervous system. Alpha GPC (choline alfoscerate, alpha-glycerylphosphorylcholine) is a compound from a group of phospholipids which is found naturally in the nervous tissue. It is an excellent source of choline, i.e. a substance with a very broad spectrum of action in the human body. It is used to remove toxins from the body and as a component of cell membranes. It is required for the synthesis of acetylcholine – an excitatory neurotransmitter – in cholinergic neurons. Alpha-GPC is a form of choline which is highly active in the nervous system because of its remarkable ability to penetrate the blood-brain barrier. As a consequence, choline alfoscerate is commonly used as a nootropic drug and a neuroprotective substance. The compound is also beneficial especially to athletes because it causes a significant increase in exercise and recovery capacity, which helps improve athletic performance. Alpha-glycerylphosphorylcholine is the most effective form of choline in terms of cognitive support. The substance substantially enhances cognitive functions and that is why it can bring benefits to everyone. The most important mechanism of action of Alpha GPC is that it boosts the synthesis of acetylcholine (ACh), i.e. a neurotransmitter which has an impact on e.g. motivation, memory, psychomotor skills and concentration. What is more, adequate ACh levels are vital to the normal response to external stimuli or feelings of emotion. What is more, Alpha GPC beneficially influences blood supply to the brain which is therefore provided with essential energy substrates and can function more efficiently. This speeds up the repair of neuronal damage. Owing to the ability to cross the blood-brain barrier, Alpha GPC is an excellent and extremely important source of choline for nerve cells. It is used therefore for the synthesis of phospholipids, which are basic components of cell membranes and have an important role in neurons and glial cells. Normal structure of these cells facilitates the conduction of the nerve impulse in the right direction. It is worth noting that when the intake of choline is too low, the body obtains it from phospholipids found in cell membranes, inducing cell degeneration. This may in turn lead to cell dysfunction, impaired concentration and memory, and in the longer run even to neurodegenerative diseases, such as Parkinson’s and Alzheimer’s disease. Because of that, Alpha-GPC is used successfully to treat these diseases and also to relieve symptoms of dementia. Choline alphoscerate turns out to be an extremely useful supplement for active individuals because it can promote training performance and post-workout recovery. In double-blind trials, athletes supplementing with Alpha-GPC could do more reps and built muscle strength faster than the control group. It has been shown that supplementing with this form may increase the natural secretion of growth hormone, which is one of the key factors contributing to hypertrophy in humans. It promotes faster metabolism and deeper sleep and stimulates the proliferation of cells – hence it is used frequently in injections as a form of doping. Alpha GPC increases the body’s natural ability to synthesise this hormone by encouraging the release of somatoliberin (GHRH) by the hypothalamus, thereby stimulating the secretion of HGH (human growth hormone) in the pituitary gland. To sum up, Raw Series Alpha GPC is a perfect supplement in capsule form which enhances cognitive functions and physical performance. In addition, it may be useful in the treatment and prevention of neurodegenerative diseases. The formulation is an excellent choice for everyone who wants to support their mental and physical health. Alpha GPC 250mg 120 caps. Take 2-4 caps per day with food, or as directed by physician. The daily dosage of 2 capsules is sufficient to correct choline deficiencies. The preparation may be used successfully as a pre-workout. It is recommended therefore to take 500-1000 mg of Alpha-GPC before exercise. In this case, it is suggested also to combine the supplement with caffeine, L-citrulline malate or acetyl-L-carnitine. The supplement will be a perfect addition to a nootropic stack composed of racetams, e.g. Noopept. In order to maximise cognitive functions, it is recommended to add a small dose caffeine or L-theanine to this supplementation regime. HPMC (vegetarian capsule), rice flour. He active form of one of the most powerful antioxidants in the lipid phase of the body.